The first tale is 27 Days by Encarnita Round (1 star) which follows Sarah through some troubles with her wife when a new love interest enters the picture. 27 Days is written in first person, which is a hard perspective to pull off, and unfortunately I think that very reason is part of the story’s downfall. As the reader, you’re so rooted in Sarah’s head that the actual actions are glossed over or jumbled most of the time. You get more thoughts and history and Sarah’s impressions than anything else. It’s so very narration heavy because it’s first person that it was hard to wade through while I read. I felt like the author was cramming information and backstory down my throat to get it out rather than letting it flow naturally and as needed, and because of this I also feel that there was some backstory that wasn’t needed and I as the reader was left going ‘okay, I know this, but why should I care when it doesn’t directly impact anything that’s going on in any of the story?’ It wasn’t just the way the story was written that didn’t grab me, but some of the characterization of the five hundred year old vampire seemed more like a teenage to twenty something girl when reacting to things internally. We continue with Bloody Flowers by Leigh Campbell (4.5 stars). The story starts with Meri at a club looking for a tasty woman to bring home to her lover and maker, Helene. She finds Diana and after a taste decides to bring her home, already feeling like the woman will be more than just a one night bite. The complications arise when it comes to light that Diana is on the run from another vampire. The writing is great, it really pulls you into Meri’s point of view as you read. As well the action scene leaves you on the edge of your seat to see just how things will turn out. Definitely worth the read, and worth watching to see what this author will produce next. As we slide into You and the Moon by Robert Hanley (3 stars) we follow the tale of Julie as she searches for the woman and scientist whose shoes she has followed since a girl. Cassandra was everything that Julie wanted to be, and every ounce the person Julie wanted to be with. Over all, the plot was an interesting one. The concept that vampirism could be cured with modern science was definitely a new spin for me. I’ve seen a lot of ways science has helped vampires to survive, from farming humans to creating fake blood, but never had the research been spurred from the remorse and guilt of what being a vampire made a woman do. I did have a few issues with characters though, as the relationship starts off a little more dangerous obsession on Julies part than love, and the accepting that Cassandra is a vampire off the bat by Julie was a little awkward since she just seemed perfectly fine with it after never having come across it before. Next we set sail with Jayne and Eleni in Love’s Horizon by Victoria Oldham (4 stars). Jayne loves the sea. She owns her own boat, uses it to ferry tourists around, and also happens to live on it. When she’s not out on open waters, she’s digging deeper into the paranormal. The combination of these two things is what draws Eleni to her, needing a human captain. The story and the characters were interesting, and I did personally find the concept of vampire pirates quite a new twist and an enjoyable one at that. I’d love to read more, both from this author but from this world and these two characters. And finally, we travel back in time with Business Makes Strange Bedfellows by E.E. Ottoman (4 stars). Gret is ahead of her time, being an independent woman that refuses to let men hold her down from getting her inheritance to becoming a doctor. One night in her lab, she accidentally releases something and to put it right hires Vi’s help in tracking and killing it. The writing is well done, the plot is most definitely an interesting one, and the ending leaves you wanting more. I also really love the tip of the hat to Lovecraft in the story. I will say though that I found the climax of the monster hunt a little rushed, but then that could just be me wanting more too. I don’t know what it is, but it always seems that as soon as I set a deadline for myself, everything breaks to hell to keep me from that deadline. I will be working harder to fix this issue so that when I say something is going to happen, it will come hell or high water happen. I’ve already talked to my friend about how what I really need to do to get back in the writing horse is set aside an hour a day to write. On days where I’m home in the afternoon, odds are it’ll be then. On days where I won’t be home until 6 or so, it’ll be started 9pm. Gives me a little bit of relaxing after the long day with prime time shows, before I put my nose to the word count. I also need to set aside some time to read so I can get through the books that are stacking up for review. It’s finally here! My very first published work (not counting the freebie I did for Earth Day)! It’s part of an anthology called Sacrificed. I’m one of four authors in it. It can be found here for purchase! This is going to be a really small update today. So, not only am I behind in my writing and word count goals, but I’m a little behind in my reading and reviewing. 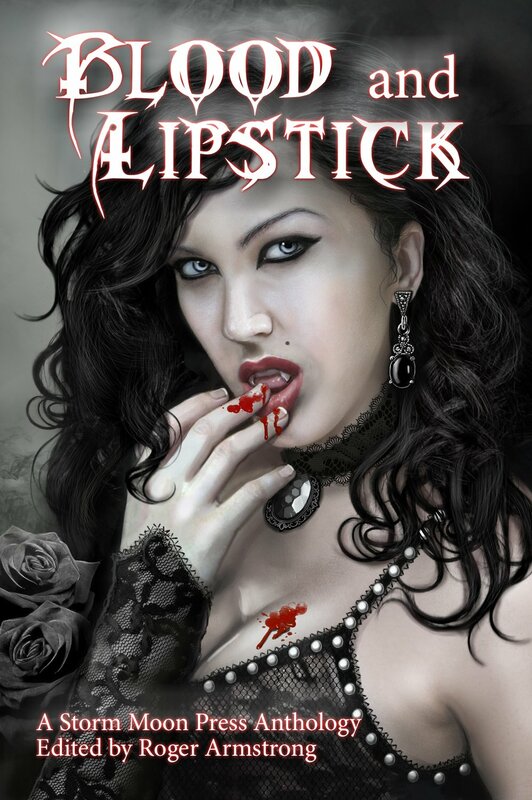 I plan to finish reading and get the review of Storm Moon Press’ Blood and Lipstick Anthology this week. I’ve been sitting on it for a while now, though I only have two stories left in it, and I am looking to push and get it done. So watch for that review probably tomorrow or Saturday. After that, I am going to be slipping out of the Storm Moon Press stuff and hit up two fantasy books. I am very much looking forward to getting into some swash buckling fantasy with these two books. And hopefully you all will enjoy coming with me on my travels through them. It’s oddly nice sometimes to get offline, hang out with friends, and just… relax unplugged. Well, I was a little plugged in until my best friend joined me out in the woods for the festival last week, but that can’t be helped when my smartphone gets better internet service than cell service out in the middle of no where. But the crux of it was, it was nice to be unplugged for a while. Get back with nature, just have some good time with friends, campfires, and some crafts. And when there’s time, get back with the old pen and paper and just… get to the essence of writing without all the distractions from the internet that can crop up. Seriously, writing with a computer that has online capabilities is sometimes like ordering a new ebook from Amazon. I go for the free book, but suddenly, ten bucks later, I have a small arsenal of new reads and I’m going ‘no, get me off here!’. Can you tell I have a very ‘Oh! Shiny!’ kind of personality? Heh. I tend to get distracted easily if I’m not careful, and even sometimes when I am careful. This week is a get back into the swing of going to work kind of week over all. Though I’m hoping that I can get back into the swing of writing as well. As per my friend’s suggestion, I need to see about putting aside one hour to write a day so even if I don’t get the thousand word (or more) goal, at least I am getting some words out. And in that hour I won’t do things like play on tumblr or poke around on facebook. Dedicated purely to writing. I want my Fae story out, damnit. And in other news this week, hopefully the anthology I’m part of will be released Friday, fingers crossed at least. And did I mention that while at the camping trip, a friend of mine said that she would help me to figure out how to format a word document so it’s all ready to self publish at create space? Because I really am seriously thinking of doing some shorter, novella length works for kindle/create space while my novel is being pushed at some big publishing companies. At least, that’s what I’m hoping for, for this Fae novel of mine. Big house publishing company. Hopefully it’s got enough potential and punch for that. I’ve gotten semi back into writing. Slowly. It doesn’t help that in two days I’ll be headed to the middle of no where for a week long festival that I run. Doesn’t add up to a lot of down time to write, but I am hoping to put the old pen to paper and see if I can’t get a little bit written while I’m there. And my phone has a talk to text feature that I can probably utilize to get it transcribed a little faster once I’m back. Wish me luck on trying to catch up on my word count, because I’m so far behind I’m gonna cry if I think about it.